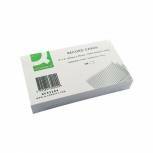 Q-Connect Record Card 203x127mm Ruled Feint White (Pack of 100) KF35206 Pack of 1 Q-Connect Record Cards, ideal for addresses and phone numbers. 100 White cards, feint ruled both sides. Size: 8x5. 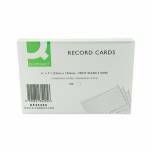 Q-Connect Record Card 127x76mm Ruled Feint White (Pack of 100) KF35204 Pack of 1 Q-Connect Record Cards. Ideal for addresses and phone numbers. 100 White cards, feint ruled both sides. Size: 5x3ins. Q-Connect Record Card 152x102mm Ruled Feint White (Pack of 100) KF35205 Pack of 1 Q-Connect Record Cards, ideal for addresses and phone numbers. 100 White cards, feint ruled both sides. Size: 6x4. Q-Connect Card Index Box 203 x 127mm Black KF10020 Pack of 1 Q-Connect Card Index Box, sits neatly on your desk keeping important records at your fingertips. Manufactured from hard wearing plastic with a hinged lid giving extra storage. Size: 203x127mm (8x5). Colour - Black. 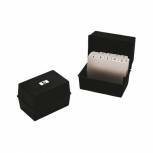 Q-Connect Card Index Box 152 x 102mm Black KF10010 Pack of 1 Q-Connect Card Index Box, sits neatly on your desk keeping important records at your fingertips. Manufactured from hard wearing plastic with a hinged lid giving extra storage. Size: 152x102mm (6x4). Colour - Black. Q-Connect Card Index Box 127 x 76mm Black KF10001 Pack of 1 Q-Connect Card Index Box, sits neatly on your desk keeping important records at your fingertips. Manufactured from hard wearing plastic with a hinged lid giving extra storage. Size: 127x76mm (5x3ins). Colour - Black. 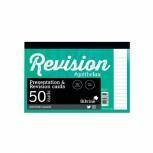 Q-Connect Guide Card 152x102mm A-Z Buff (Pack of 25) KF35208 Pack of 1 Q-Connect Guide Cards. Strong manilla guide cards tabbed in 25 positions, A-Z. Colour - Buff. Size: 6x4. 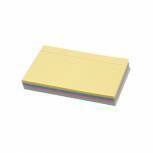 Q-Connect Guide Card 203x127mm A-Z Buff (Pack of 25) KF35209 Pack of 1 Q-Connect Guide Cards. Strong manilla guide cards tabbed in 25 positions, A-Z. Colour - Buff. Size: 8x5. 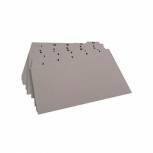 Concord Record Card 127x76mm Assorted (Pack of 100) 16099/160 Pack of 1 Quality 230 micron board record cards. Can be written or typed on for card indexing systems. 5x3in Assorted contains 25 each of Blue, Pink, Green and Yellow. 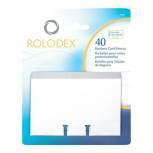 Rolodex Business Card Sleeves Clear (Pack of 40) S0793540 Pack of 1 Clear sleeves for business cards. Made of transparent durable plastic. 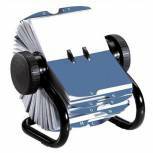 Designed for use with Rolodex contact management systems. With twin hole punch for use with Rolodex rotary files. Format: 2.25 x 4 inch (57 x 102mm). Pack of 40 sleeves. 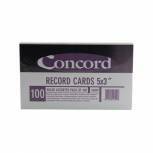 Concord Record Card 152x102mm Assorted (Pack of 100) 16199/161 Pack of 1 Quality 230 micron board record cards. Can be written or typed on for card indexing systems. 6x4in Assorted Colours contains 25 of Blue, Green, Pink and Yellow. 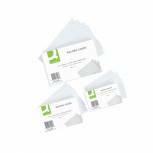 Q-Connect Guide Card 5x3 Inch A-Z Buff (Pack of 25) KF35207 Pack of 1 Q-Connect Guide Cards. Strong manilla guide cards tabbed in 25 positions, A-Z. Colour - Buff. Size: 5x3ins. 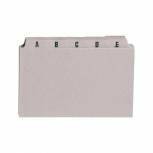 Rolodex Classic 500 Rotary Card File Black S0793600 Pack of 1 Classic design open files that are made with a tough tubular metal frame and high gloss finish. A ball bearing clutch system allows easy turning an holds cards firmly in position whilst viewing. 57x102mm card size Black. Supplied with 500 cards. 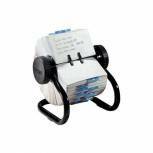 Rolodex Classic 200 Rotary Card File Black 67236 Pack of 1 Rolodex Classic 200 rotary business card index with 200 sleeves and 24 A-Z index tabs. Organises and protects business cards and holds up to 400 cards in durable transparent sleeves. Black. Bisley Lock For Card Index Cabinet Drawer FCB21A Pack of 1 Optional lock for the Bisley Card Index Cabinet. Ensures protection against theft. Easily added to your drawer. 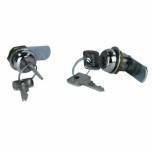 Reliable and hardwearing lock. 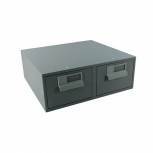 Perfect for Double Card Index Cabinets..
Bisley Card Index Cabinet 152x102mm Single Grey FCB14 Pack of 1 All models feature a card support plate, a patented linking device for rigid multi-unit arrangements and a plastic moulded handle and card frame. They are easily converted to locking. Goose Grey. 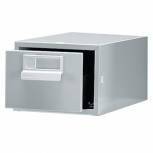 Bisley Card Index Cabinet 203x127mm Single Grey FCB15 Pack of 1 All models feature a card support plate, a patented linking device for rigid multi-unit arrangements and a plastic moulded handle and card frame. They are easily converted to locking. Measurements shown are of card size. 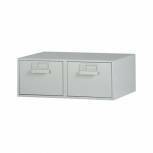 Bisley Card Index Cabinet 152x102mm Double Grey FCB24 Pack of 1 A 2 drawer version of the Bisley card index cabinet. Goose Grey. 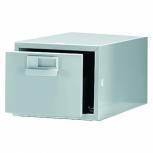 Bisley Card Index Cabinet 203x127mm Double Grey FCB25 Pack of 1 A 2 drawer version of the Bisley card index cabinet. Goose Grey.